← Crystal Nights – published! Crystal Nights – the first review! I am still scatterbrained after the successful launch yesterday so instead of trying to do anything sensible, I spend my time on Facebook, telling other writers how important your network is. And I mean every word! Thanks to lovely friends and faithful readers, the first review of Crystal Nights appeared yesterday. Crystal Nights, A Scandinavian Mystery by Dorte Hummelshoj Jakobsen is an extraordinarily interesting chilling read that captivated my senses right away. The author has a unique style that I can see readers gravitating towards. An unusual way of telling a fictional story that plays true in many ways. She has an authentic voice that I found easy to absorb as I went through this story rather quickly, as if it was urgent business. With my curiosity spiked, I needed to know where this would lead. The riveting mystery called me to attention and the smooth, clever writing style had me turning the pages with a certain enthusiasm I don’t always get from reading a book. This one took me in from the very beginning. Crystal Nights is a gripping thriller that captured the essence of the time and the place. Emotional, it stirred feelings in me I didn’t realize were there. 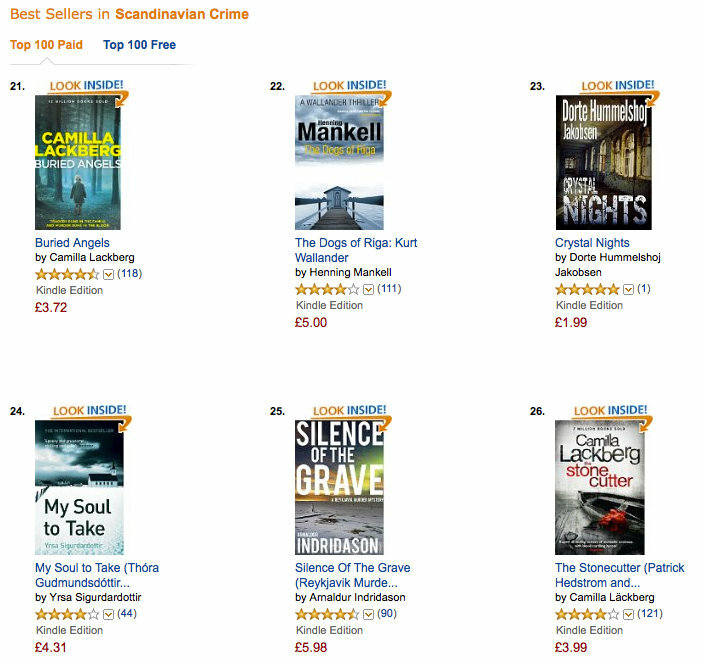 And this morning, my brand-new novel was # 23 in the special, British category ‘Scandinavian crime’ – in the very best company. Happy and grateful? Yes, indeed. 4 Responses to Crystal Nights – the first review!